E-commerce automotive aftermarket refers to an e-tailing platform where auto parts are sold to do-it-yourself customers and service professionals through the internet. The aftermarket covers all automotive spare parts, equipment, accessories and services related to automobiles that are procured after periodic vehicle use through E-commerce portals. Increasing ecommerce platforms and collaboration between E-commerce platform providers and brick and mortar stores is anticipated to drive the E-commerce automotive aftermarket market throughout the forecast period. According to the research report, the global e-commerce automotive aftermarket is expected to be worth US$137 bn by the end of 2025, surging at a phenomenal pace of 18.5% CAGR. The e-commerce automotive aftermarket market is segmented by product type, channel, and geography. On the basis of product type, the e-commerce automotive aftermarket market has been segmented into braking, steering and suspension, hub assemblies, universal joints, gaskets, wipers, filters, lighting, and spark plugs. Under braking, the market is further segmented into brake pads, hydraulics and hardware, and rotor and drum. Steering and suspension segment covers ball joints, tie rods, sway bar links, bushings, bearings/seals, and coil springs. By channel, the e-commerce automotive aftermarket is classified into marketplace, 3rd party standalone e-tailer, and direct to customer. Hub assemblies, universal joints, and steering and suspension products are the most complex parts and has higher replacement cost as compared to other products. The filters, brake pads, gaskets, wipers and lighting is anticipated to expand at a relatively faster growth rate than steering and suspension, hub assemblies, and spark plugs owing to ease of replacement and having lesser technicalities involved. Features such as personalized internet marketing and advertising, advanced e-cataloging, multiple payment options and reduced shipment times is anticipated to boost the global e-commerce automotive aftermarket. Based on channel, the e-commerce automotive aftermarket market has been segmented into marketplace, 3rd party standalone e-tailer and direct to customer. Factors such as increasing number of do-it-yourself (DIY) consumers and flexibility of extensive online research are supporting the industry growth. The increasing combination of ‘brick and click’ model is anticipated to drive the e-commerce automotive aftermarket. The running investments by the competitors and growing m-commerce spending will develop new opportunities for the e-commerce automotive aftermarket globally. Mergers, acquisitions and regional expansion strategies are being adopted by key players in the e-commerce automotive aftermarket. All these factors help the e-commerce companies to understand the demand and supply gap in the regions. These partnerships are permitting e-commerce automotive aftermarket to extend their services, offerings and provide customized services to the end users based on their requirements. The third party standalone e-tailer segment is expected to grow at relatively faster than marketplace and direct to customer segment during the forecast period. In 2017, the third party standalone e-tailer segment accounted for about 51% of total E-commerce automotive aftermarket. Asia Pacific is expected to dominate the global e-commerce automotive aftermarket by 2025. Many government initiatives in emerging nations such as “Digital India” and collaboration between brick and mortar stores and E-commerce platform providers and is anticipated to boost the industry demand in Asia Pacific region. In 2017, China is expected to have highest market share accounting for approximately 34% of Asia Pacific market. The global market revenue stood at US$ 30.03 Bn and the shipments were 2.4 million units in 2016. 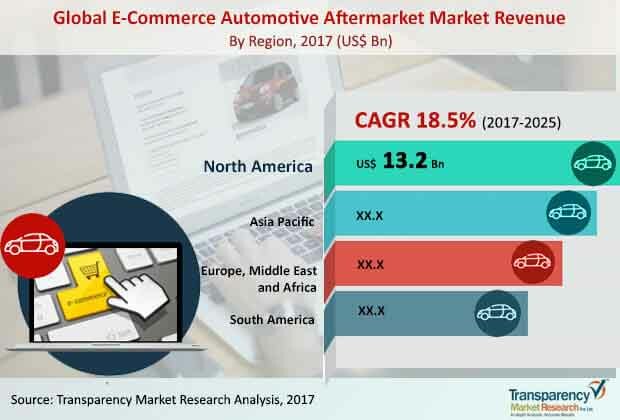 The global e-commerce automotive aftermarket market is quiet consolidated with presence of major companies accounting for the majority of the market share. Numerous medium and small players also have regional presence through various platforms such as marketplace or third party e-tailers. Some of the major industry participants in the E-commerce automotive aftermarket include Advance Auto Parts, Alibaba Group, Amazon Inc., AutoZone Inc., National Automotive Parts Association, DENSO Corporation, Pep Boys, U.S. Auto Parts Network Inc., EBay Inc., Rakuten Commerce LLC, Cdiscount, Das Ersatzteil GmbH, ERA SPA, CATI SpA, AliExpress, DNABER Auto Parts, O'Reilly Automotive, Inc., Q-Parts 24, Shopee365, and LKQ Corporation. The automotive industry is flourishing in the emerging economies of China and India on the back of increasing income per capita of the urban populations. Since these two countries are vastly populated, the automotive industry is expected to continue gaining new demand for a foreseeable future. At the same time, the concept of ecommerce has finally penetrated these two Asia Pacific countries too, opening up a prospering market for e-commerce automotive aftermarket market, which relates to providing the products and services once the vehicles are sold. Since the maintenance of an automotive product is tiresome job owing to various components it constitutes with, a number of consumers are resorting to alternates that meet their requirements. The vendors of automotive aftermarket cater to localized demand and offer moderate products and services at lower costs. Consequently, this report projects the demand in the global e-commerce automotive aftermarket market to experience incrementing demand at a highly impressive CAGR of 18.5% during the forecast period of 2017 to 2025. The analysts of the report have evaluated that the global ecommerce automotive aftermarket market wil be worth US$137 bn by 2025. Along with data on how the demand has evolved in the recent past and what progressions can be expected over the course of the forecast period, the report also provides in-depth analysis of market dynamics such as trends, barriers, and drivers as well as gauges the potential of demand that can be expected from various important regions and countries. To complete a thorough study that acts a decision-making tool for targeted audiences such as automotive aftermarket original equipment manufacturers (OEMs) and third party vendors and ecommerce service providers, the report has included a featured chapter on the existing competitive landscape of the global ecommerce automotive aftermarket market.